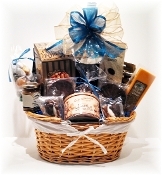 Wonderful Mother's Day Gift Baskets Delivered! Spring has Sprung! Here are some fresh basket ideas to help someone special enjoy the season! And right aaround the corner comes the beach and the lazy, hazy days of summer! Pretty and Pastel! Great for Baby, Spring, Easter, or Feminine Themes! Container in various pastel shades, filled with 2 kinds of Olde Colony Cookies, Northwood cheese 7 oz. stick, Large bag of Lindor Truffles, Rainbow Row Trail Mix, 3 Pepper... Small pastel woodchip container--Big Impact for Spring, Easter, New Baby or Feminine themes. Filled with: Pirouline Chocolate Twists, Benne Cheese Zingers, Key Lime cookies Wine and Cheese biscuits, Smoked Almonds. Embellished with themed chocolates. Wine option at additional cost. 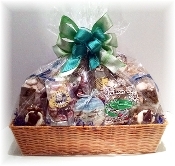 "The Seaside Vacation" Gift Basket "Sweet Evening" Gift Basket Undecided? No food to cook, just wine and the beach! Please note, due to perishability, we must substitute for the tomato pie and pimento spread with a Gullah Gourmet Gumbo Mix in SHIPPED baskets. Includes: 2 wine choices 1 Three pepper water crackers 1... Wonderful for a "thinking of you" or "just because" gift. 1 Big bag of Godiva chocolate Truffles 1 Pirouline chocolate crème filled wafers 1 Cookies from Olde Colony Bakery 1 Wine and Cheese biscuits from Los Olivos 1 Salt Water taffy 1... Don't see anything you like? Let us help! 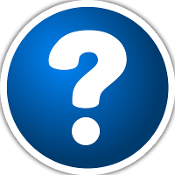 Just click on the big blue question mark, fill in the requested information, and we will do the rest! 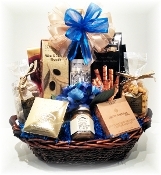 Basket prices from $50.00 to $150.00 for any occasion. And don't forget to add your card message during checkout! Happy Spring and Summer! Don't forget to add a card during checkout!